When I first started out I only cage bred my birds. I just didn't have the money or place for an aviary. Because I live in California where the weather's nice year round all my breeders are kept outdoors. Not only do they get the benefits of view and natural sunshine but this also helps keep mess under control. Eventually I built my first flight. I haven't looked back since. I may end up cage breeding again if the situation pushes me to it but it's not something I'd willingly do. This is just my own preference though. Pros Cages give you the ability to control your flock. They offer better protection against injuries (mostly caused by other cagemates), diseases and they allow you to control which birds breed with each other. They also allow you to create pair specifications like specialized diets. Birds are easier to monitor and you can easily tell if something is wrong with one of them. Cages conserve space and are much cheaper that flights. They can be easily suspended to allow food to drop through the floor or to give the pair an added sense of security. Cons Unless the cages are housed indoors or within an aviary themselves you will have escapes. This is the number one reason I gave up on cage breeding. The risk of losing birds and the paranoia caused by the thought of losing them are too great. Another problem is that cages are often too small. Birds can become lazy in them or not get enough exercise. Let's face it, birds are ultimately designed for flight. They have tons of adaptations all geared towards flight and unless they are allowed that luxury they can have all kinds of ill secondary affects. Cages are also somewhat limiting. Unless you breed smaller birds and have a large enough cage most of the time you'll be restricted to one pair per cage. It can be expensive to purchase a cage for every pair. What You Should Look For Cages should always be square or rectangular, never round. Vertical bars are a must since many birds have difficulty climbing horizontal ones. The floor should be wire to allow droppings and old food to pass through. The general rule is always buy the largest cage you can afford. Pros Aviaries, or flights, have the most benefits. Though larger and much more expensive if you care about the happiness of your birds this is usually the best way to go. Aviaries provide birds the opportunity to act like birds would in the wild. They can form miniature flocks, socialize, pick their own mates and fly. They are also very beneficial to the breeder. I have benches in each of my aviaries. Whenever I feel like it I can go out and sit, relax and watch. There is nothing quite so mentally pleasing as watching your birds interact with each other as a flock. Many breeders tend to get burnt out or frustrated after years of hard work. Many of them tend to forget the magic that captivated them into breeding birds in the first place. 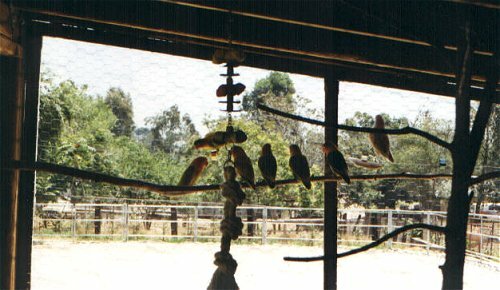 Aviaries allow you bond with your breeders. It's a whole new level. Cons Aviaries are not without problems though. In general you run a much higher risk of disease and injury with them. Disease will spread much quicker and your whole flock might be destroyed. Birds can fight or fly into something causing injuries or death. Then there's the problem of not knowing who the father of the chicks are (especially if you happen to breed budgies). You can no longer specialize diet either. Everyone will have to eat the same thing. One benefit of this though is that if you can get one bird to eat a type food nobody likes they'll all start eating it too. Aviaries must be equipped with a safety porch to prevent escapes. The floors should be concrete not earth (unless you're particulary fond of animals burrowing in, the wooden supports dissolving in less than three years and your birds getting worms). Aviaries can be any shape though the rectangle is preferred for breeding flights. If outdoors they must be provided with a roof and at least two sides should be covered. Aviary wire should be as small mesh as possible to exclude unwanted intruders (this goes for any outdoor cage). Mice can squeeze through 1/4 inch wire. I'm not kidding! I've seen them do it! It's like watching a cartoon.